PRNewswire-Asia/ — The Hongkong and Shanghai Hotels, Limited (HSH) announced its 2011 unaudited first quarter operating statistics at its Annual General Meeting held earlier today. There was general improvement in performance for its three business divisions, with better operating statistics this year than in the first quarter of 2010. All the Peninsula hotels recorded an increase in average room rate and revenue per available room (“RevPAR”) in the first quarter of this year. The RevPAR increases for the Peninsula hotels in Hong Kong, other Asia and the United States were respectively 13%, 12% and 19%. The Peninsula Tokyo experienced a sharp fall in occupancy following the massive earthquake which occurred on 11 March 2011. After the earthquake, the hotel remained open throughout and extended assistance to the local community, including providing refuge to members of the public who were stranded without transportation. Although there has been some return to normality, business at the hotel continues to be negatively affected by concerns about the radiation leakage. Occupancy is currently running in the 30 to 40% range at a lower average rate, whilst food and beverage business has been relatively resilient due to local demand. In response, the hotel has launched a series of local promotional offers targeting domestic leisure and corporate businesses, as well as invoking cost savings measures. Business at the shopping arcades in all the Peninsula hotels remained healthy. The Peninsula Beijing arcade upgrade is well advanced without any tenancies being disrupted and is scheduled to be completed in mid 2011. The Group’s commercial properties in Hong Kong, including The Repulse Bay Complex, the Peak Tower, St. John’s Building and the Peninsula Office Tower, all showed further revenue growth, reflecting sustained demand for high-end residential leasing, Grade A offices and retail spaces. Patronage for the Peak Tramways rose 2% year-on-year. Wholesale and retail sales at Peninsula Merchandising were also strong. The performance of the other businesses within this Division was consistent with the first quarter of 2010. HSH continues to focus its development resources on three major projects: development of The Peninsula Paris hotel, which is expected to open in 2013; the planned major renovation of The Peninsula Hong Kong; and the enhancement of the residential portions of The Repulse Bay Complex. HONG KONG and MACAU, May 16, 2011 /PRNewswire-Asia/ — At 4:51pm on May 15 Galaxy Macau( http://www.galaxymacau.com/en )(TM) officially opened its doors, welcoming over 20,000 guests within its first 90 minutes to the delight of over 3,000 VIP attendees. The only property of its kind to open in Macau this year, Galaxy Macau is anticipated to receive between 30,000 and 40,000 guests per day, each of whom will be able to experience game-changing resort features at Macau’s newest integrated destination resort. Dr Lui Che Woo, Founder and Chairman, Galaxy Entertainment Group (GEG, SEHK stock code: 00027), said, “Galaxy Entertainment Group is committed to the local economy by helping transform Macau into a diversified global tourism and entertainment hub. By integrating traditional Asian culture with Western management style, we have created a business model with ‘World Class, Asian Heart’ that will drive the success of our signature property, Galaxy Macau, and help realize Macau’s vast potential as a tourism destination. The Grand Opening ceremony was attended by hundreds of VIPs, including His Honorable Dr Fernando Chui Sai On, Chief Executive of the Macau SAR; Vice-Chairman of the Chinese People’s Political Consultative Conference; Mr Mao Xi Wei, Deputy Commissioner of the Ministry of Foreign Affairs of the People’s Republic of China in the Macau SAR; and Mr. Chang Yuxing. Following the program of traditional lion dances, firecrackers and a spectacular Asian dance procession, Dr Lui, GEG Vice Chairman Mr Francis Lui and officiating VIPs cut the ribbon signalling the official opening of Galaxy Macau. The doors then opened as senior Galaxy executives welcomed members of the public as the property’s very first official guests. Banyan Tree Macau( http://www.galaxymacau.com/en/hotel/banyantreehotel ), Hotel Okura Macau( http://www.galaxymacau.com/en/hotel/hotelokura ) and Galaxy Hotel( http://www.galaxymacau.com/en/hotel/galaxyhotel )(TM) offer a total of 2,200 five-star rooms, suites and villas, accounting for nearly 12% of Macau’s current room total and nearly 20% of its five-star capacity. The spectacular resort features of the HK$14.9 billion property are concentrated in its Grand Resort Deck, where a 350-ton white sand beach frames the 4,000-square-meter skytop wave pool, the world’s largest of its kind. Several pools, gardens and private cabanas dot the area, making it perfect for private and corporate functions. The Grand Resort Deck also features the first Banyan Tree Spa in the Pearl River Delta, which at 3,400 square meters is also the biggest in the Banyan Tree group. Galaxy Macau features more than 50 international food and beverage outlets. True to its focus on providing an authentic Asian resort experience, more than half of them serve Asian cuisines, making it the widest such selection in Macau under one roof. The selection makes it possible for visitors to eat at Galaxy Macau once a week for a year and never eat at the same restaurant twice. Rounding out Galaxy Macau’s resort offering is extensive in-house entertainment across multiple venues, including the soon-to-open, ultra-exclusive China Rouge, a hybrid private membership club, performance theatre, bar and restaurant conceptualized by renowned Hong Kong designer Alan Chan to evoke a modern vision of 1930s Shanghai. It is anticipated that China Rouge will instantly become one of the trendiest nightspots in Macau, drawing discerning clientele from around the region. Of particular note, Galaxy Macau is proud to announce its plans for a 9-screen, 3D, multi-function cinema theatre to follow later this year. Open to the local community and Galaxy Macau guests, the theatre will be state-of-the-art and the first of its kind in Macau. The property also features retail boulevards offering a unique shopping experience of Asian as well as international brands. 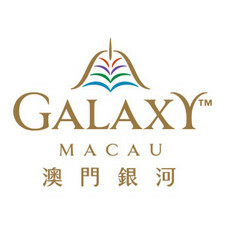 Galaxy Entertainment Group (“GEG”), through its subsidiary, Galaxy Casino, S.A., holds a Macau gaming concession. GEG is authorized to carry out casino games of chance in Macau, which is the only legal gaming location in China. GEG currently owns and operates StarWorld Hotel and Casino 每 a luxury 5-star property located on the Macau peninsula 每 and operates four City Club Casinos in Macau. GEG has also developed Galaxy Macau(TM), a fully integrated leisure and entertainment destination resort. This resort further expands the diversity of GEG’s businesses and enriches Macau’s tourism offerings. Hotel(TM). Facilities include a selection of more than 50 food and beverage outlets, including the widest selection of pan-Asian cuisine in Macau; distinctive retail shopping; and the Grand Resort Deck with lush oasis gardens covering its 52,000 square meters, the world’s largest skytop wave pool, and a 350-ton white sand beach. For more details, please visit http://www.galaxymacau.com. The leading international operator in the boutique resort, residences and spa industry, Banyan Tree offers a signature blend of romance and travel with a green conscience. The philosophy behind the hotels, resorts, residences, spas, retail galleries and destination club is based on rejuvenation of the body, mind and soul 每 a Sanctuary for the Senses. Angsana Hotels and Resorts is the ideal complement to Banyan Tree, comprising contemporary, chic and ecologically sensitive retreats. Based in areas of outstanding natural beauty and exciting city hubs, Angsana hotels, resorts, residences, spas and retail galleries reflect the spirit and communities of its environment. To date, the Banyan Tree Group manages and/ or has ownership interests close to 30 resorts and hotels, over 60 spas and over 80 retail galleries; as well as three golf courses. Okura Hotels & Resorts is an international hotel group operated by Hotel Okura Co., Ltd. Working with its corporate philosophy of providing the best accommodations, cuisine and service (Best ACS), Okura Hotels & Resorts commands a total of 24 member hotels in Japan and abroad, including three new hotels that are planned to be opened in the near future. Over the 30 years that have passed since its formation, Okura Hotels & Resorts has constructed a global network of high-quality international hotels. Fusing the delicate beauty and subtleties of Japanese culture with European and American convenience and functionality, Hotel Okura Macau welcomes guests from around the world to its spaces of relaxation and comfort.